LCol Steven Richards, Deputy Director of Military Prosecutions (West), is hard at work in his brand new office in Naden Building N30. 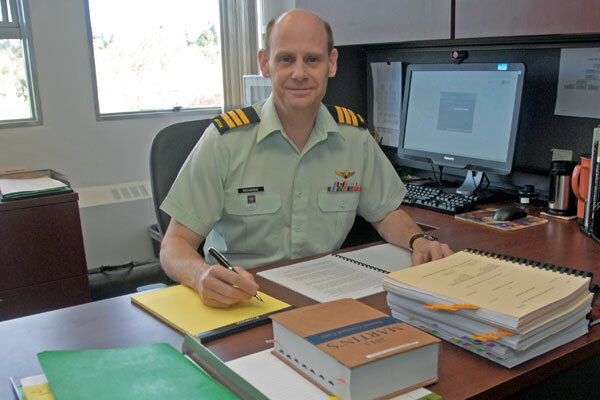 The opening of the Regional Military Prosecutor (RMP) office at CFB Esquimalt last summer was a clear sign this resource was much-needed locally. But finding a place to house the RMP (Pacific) office and the Deputy Director of Military Prosecutions for Western Canada, LCol Steven Richards, has taken a little time. Good news, he’ll no longer be rooming with the Assistant Judge Advocate General (AJAG) staff. The finishing touches are complete in his new three office space in building N30, and with it will come more staff to help him prosecute cases. He’s expecting a Regional Military Prosecutor in July, and a civilian legal assistant to compliment his roster. The RMP is a branch of the Judge Advocate General (JAG) that, much like AJAG, provides legal counsel and services to the Formation. While AJAG deals with a wide range of legal subject areas, including laws pertaining to the conduct of military operations, the RMP is focussed specifically on military justice, including prosecution of court martial cases. The branch works intimately with the National Investigative Service (NIS), a branch of the Military Police that carries out serious or sensitive investigations in relation to cases involving military members, such as drug related crimes. The Military Prosecutions Office offers legal advice to the NIS during their investigations. While the specifics vary from case to case, the RMP may advise the NIS on laws that need to be followed while conducting an investigation, such as ensuring evidence is collected in a way that lawfully maintains a defendant’s rights. “For example, there may be situations in which evidence is collected but can’t be admitted at trial because investigators found it in a place they weren’t authorized to search,” says LCol Richards. The RMP (Pacific) was created after the Formation and the National Investigative Service (NIS) saw an increased need for coverage and resources on a regional level. There are four other RMP offices across Canada: one at CFB Halifax, CFB Valcartier, CFB Ottawa, and CFB Edmonton.